Not only has the city created more incentives for people to purchase and maintain historic structures than ever before but with this newfound consciousness of history’s value in our relatively young city, more people are realizing the importance of this practice to create a sustainable and economically beneficial trend for Houston’s growth. 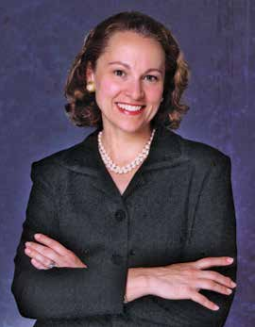 Boesel, through her unwavering determination, has managed to significantly help change attitudes towards preservation locally and continues to embody Houston’s can-do spirit that enchants those involved with the city. 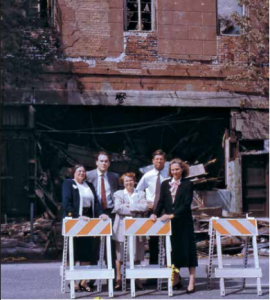 Preservation Alliance and the Downtown Historic District persuaded the city to commit $126,000 to the owner, the building was demolished in 1991. Left to right: Jill Sewell, Kent Millard, Margie Elliott, Guy Hagstette, and Minnette Boesel. Learn more about Preservation Houston. Click here for a closer look at Houston’s Historic Preservation Ordinance. 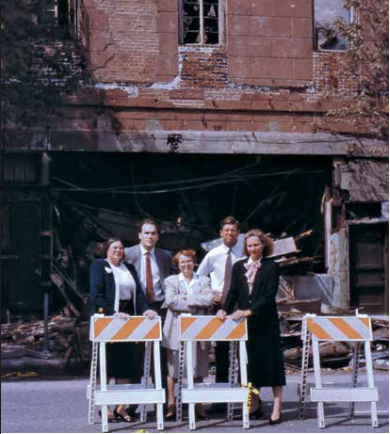 For more information on preservation, read the Historic Preservation article by Minette Boesel from Houston History published in 2006. Purchase The Houston Review – Historic Preservation!